The motto around the Ti Cycles shop is "Anything Is Possible". If something was made once, it can be made again. One of the more complicated frame repairs in recent memory was a composite Lemond Tete de Course, half titanium and half carbon fiber, that required a downtube replacement. Before we could replace the titanium tube we needed to un-bond the top of the frame from the bottom. For this task we called on our friends at Ruckus Composites here in Portland, masters of the art of carbon fiber. The carbon sections needed to be out of the frame, but able to be put back in to place to set up the frame jig for welding the new downtube to the original bottom bracket shell and head tube. During this process while the downtube is out of the frame the head tube is completely disconnected, as are the carbon fiber tubes, meaning the frame is almost completely disassembled. Only the chainstay welds at the dropouts and bottom bracket shell remain from the original assembly. After the new downtube was installed the titanium sections were brushed up to a beautiful shine and transported in a box back to the Ruckus labs for the carbon fiber reassembly. Then the frame came back to us one last time for final detailing and wax anti-fingerprint sealant before heading home to its owner. 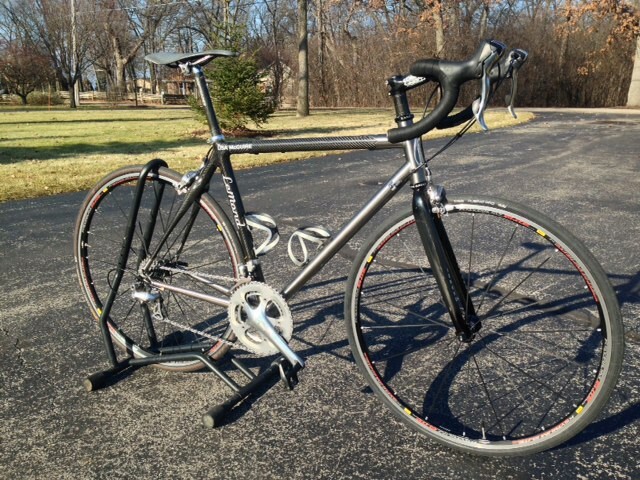 "Everyone is impressed with the work and craftsmanship of Ti Cycles, as the frame looks beautiful. Your service and final product was excellent." For such a small part of a frame, the little dangly derailleur hanger is involved in an inordinate number of repairs. It is a small piece of material, but it is vitally important, unfortunately located, and relatively fragile. Most classic frames and some modern custom frames built for confident ballers have contiguous or "fixed" derailleur hangers that are part of the dropout itself. Because it is so vital and fragile, modern mass produced bikes generally have replaceable hangers that bolt on with smalls screws, allowing a failure mechanism that in most cases has no potential to ruin the entire frame. Regardless of the main frame material, these replaceable hangers are primarily aluminum or titanium. A sensible and practical design feature, replaceable hangers can still be poorly executed. 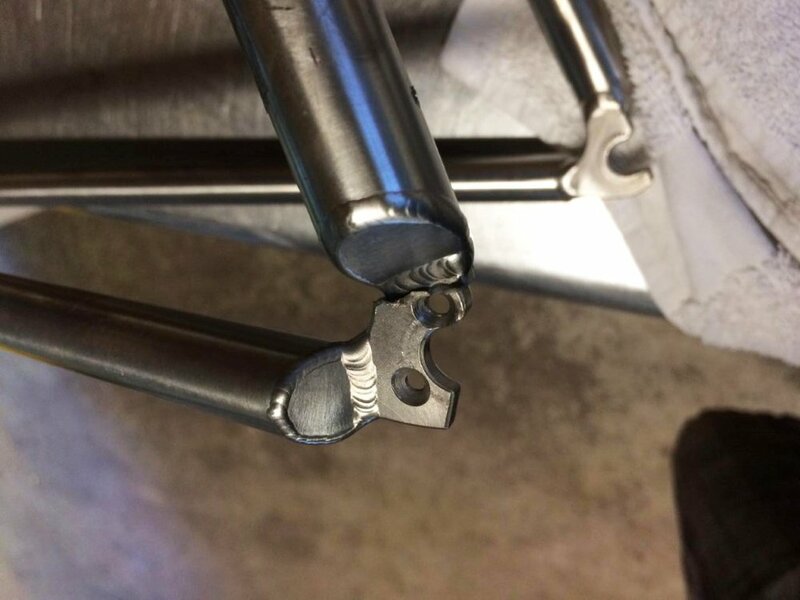 Photos below show one such design; a replaceable hanger made of steel on a high end titanium frame where the mounting holes on the dropout leave precious little material around the edge and have a countersink radius that cuts right through the heat affected zone of the chainstay weld. The latter situation resolved itself in a crack through the weld, even though the hanger was ruined at the same time of the source impact. We can easily repair the crack, but the original flaws in the design still remain and would surely cause the same result in another crash. As a solution Dave fabricated a new titanium hanger to match the interface and location of the original, and then welded it all together into a solid hanger far stronger than the original. The Moots YBB system, still in use today, came to prominence two decades ago and saw widespread use by several prominent titanium mountain bike builders. The system is simple, using a monostay configuration with a spring and/or elastomer stanchion up top and vertically compliant chainstays down low to allow for vertical movement of the rear axle. At a time when full suspension designs were often large, complex, heavy, and largely ineffective, a YBB "soft tail" could smooth much of the chatter of XC trails with relatively little fuss. With the breakneck pace of modern suspension improvements the YBB soft tail system may seem rudimentary, but it has proven extremely durable and reliable over the years and is an integral part of many great vintage mountain bikes, most of which are still on the trails. But all things wear out in time, and we have regularly been servicing YBB systems on Moots, Merlin, Litespeed, and other titanium bikes for many years. Generally this consists of cleaning and lubricating the parts still fit for service, or machining a new stanchion, and in the case of Litespeed modifying the Moots YBB guts that are still available to fit in the smaller diameter setup. A recent Merlin project presented a different challenge; not only did the YBB guts need serviced, the aluminum bridge clamping mechanism connecting the suspension with the rear end had cracked, requiring the machining of a whole new yoke. As far as we know this is the only Merlin Fat Beat on the planet with a black yoke, made entirely in house. Cinelli quill stems are part of cycling history. There are thousands upon thousands of them in circulation on vintage bikes of all types with threaded fork steerers. They're a great part, save for one weird little bit -- the stock Cinelli quill stem bolts use a 7mm hex key and have a 7mm x 1mm thread draw bolt with a tapered nut. This 7mm business is problematic for a couple of reasons. Virtually no multi tool or standard hex tool set includes a 7mm wrench. There are no draw bolts with 6mm hex fittings and 7x1 thread. Standard 8mm draw bolts have both a different thread size and a head diameter that is too large for the 12mm pocket in most vintage stem bodies. We of course partially solved this issue with our M8 stainless steel and M8 titanium draw bolts, which have an optional aluminum wedge we machine in house as an upgrade to the clunky cast steel wedges found in many traditional quills. Those bolts both have a 12mm OD head that will fit in the Cinelli stem body, but the M8 threading is incompatible with the Cinelli cone nut and our wedges will not work with the tapered nut system. To cut through all of these contradictions at once and do the world a favor by slowly removing the oddball 7mm bolts and cones from circulation we are now offering a fantastic update service to make this style of Cinelli quill stem compatible with standard 8mm draw bolts. You send in your stem, we change the thread size on both the cone anchoring the quill draw bolt and the single pinch bolt handlebar clamp to 8mm and provide 8mm titanium bolts with normal 6mm hex fittings for both locations. Yep, you can have a Cinelli quill stem that is both lighter and more convenient!